In front of an enthusiastic capacity Forum crowd, Brazilian President Dilma Rousseff offered a vision of growing global importance and economic vitality for her country. She spoke of Brazil’s growing middle class, increasing prosperity, decreasing social inequality, and emphasized the continuing need to improve both the access and quality of education for Brazilians to increase competitiveness. 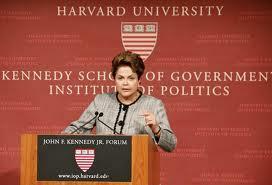 She concluded this memorable Forum by reiterating that “Brazil needs Harvard as much as Harvard needs Brazil. Harvard Kennedy School Dean David Ellwood moderated the Forum and Merilee Grindle, Director of the David Rockefeller Center for Latin American Studies, provided the President’s introduction.